It's a jaeger bomb! The jaeger costume is a black piece of poster board. Cut another piece and cover it with duck tap. The straps were bought at a dollar store. Velcro strips. I just hard wrote the words. 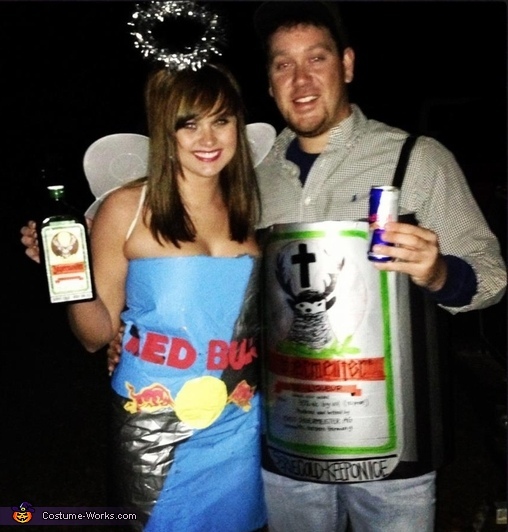 The red bull costume is a big piece of plastic that was over a cardboard box! I covered it with duct tape. I used the same Velcro strips ran them down the side of the dress. (Had to measure to get the right fit) I used paint for the blue area. And I had a friend draw the bulls and I glued them on. It was super cheap and easy!